Inventory We are a resale marketplace, not a box office or venue. Ticket prices may exceed face value. This site is not owned by HEB Center at Cedar Park . 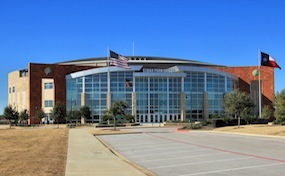 The HEB Center Cedar Park was fist opened for business in 2009. Located in Austin, Texas the HEB Center Cedar Park is yet another testament to the bustling Austin music scene. Austin has become known as a great place to enjoy all kinds of concerts and events and in an effort to provide more fans with this experience the HEB Center fills this void. The American Hockey League has the Texas Stars making this their home ice. With seating for 6,800 people the venue has held many sold out performances is its short lived history. Outside if Concerts and Hockey the HEB Center Cedar Park has also hosted some MMA fights, and other various events. CenterCedarPark.com is a privately owned and operated company that specializes in offering low prices and a great selection of inventory online for all secondary market events. We are not affiliated with any primary supplier, website, or box office. Online prices can fluctuate below or above face value and will change with the market. To purchase tickets for all HEB Center Cedar Park events simply click on the event of interest or pick up your phone and call our operators who are standing by at anytime.